Thank you all for the comments we received to this blog. We are now closing comments on these posts to avoid too much spam. Well, that’s it. We are now in Johannesburg on our way home. I tried to load a picture, but it keeps failing to load. We are all well. There have been no major incidents and out first flight was good. Before I came to Malawi I had an image of it in my head.I imagined people with absolutely nothing wanting to be in a different situation with a different life. After arriving in Malawi, I found this to be a very stereotypical view of African society. Instead, we were met with a country in severe poverty, but with people who are accepting of their fate. The majority of people we have met are thankful for what they have and wish only for the simple things we all take for granted, clothes, warmth and a hope for the future. The thing that surprised me most about Malawi is the community which they have – something that is lacking in Western society. Friends, family and neighbours would do anything for each other and for us also. I think it was on seeing the community which made me realise why people aren’t desperate for an escape – they have each other. Without the support of those around them, people simply would not survive. As expected, seeing the poverty that is deeply embedded in Malawi has made me realise how lucky I am, but not in the way you would imagine. I don’t now want to go home and throw away all my belongings. Instead, I would like myself and those around me to see that we can survive without some of the things we see as necessities. The thing that I have liked most about this trip to Malawi has been seeing the changes that are being made to make people’s lives better and more sustainable. The Street Kids Programme is incredible as it allows orphaned children on the streets to have an education. There is also a massive push to keep girls in school, which gives them hope and more opportunities. Overall, I have absolutely loved the experience of coming to Malawi and as clichéd as it sounds, it has definitely changed the way I look at life. Written in the Headteacher’s study at Draper Secondary School. Having an amazing experience here in Malawi and feel quite emotional when I think we are on our second last day. It’s hard to believe that this time last week we were on the flight to Blantyre, having had a chaotic run in Johannesburg to catch our connecting flight!! It’s so funny looking back on it and writing this sitting in fresh clothes from our suitcases! We lived in the clothes we travelled in for nearly three days!! But at least we were all in it together! Sitting writing this watching Gavin, Alan and the Deputy Head from Draper Secondary School in a big discussion about how we can build relationships with the school and about materials and educational standards. John and Lauren are here as well, while Margaret and Sue and some of the village ladies cook up a Scottish extravaganza (stovies with oatcakes and shortbread) for us all to share in at lunch time. Had an incident this morning with missing onions, thinking the baboons had taken them from the balcony overnight. Thank goodness the hotel staff had thought about this and put them in a safe place. Reflection is a funny thing and constantly reflecting on our amazing journey and the bonds and friendships made between our group and the wonderful people here. We have all been so so blessed. At breakfast and dinner time we all sit together with Margaret and Silas included. A prayer is said before we eat and we all laugh and Silas usually asks us individually to share about our experiences of the day. It’s actually my favourite part of the day! As we drink Malawian Mzuzu coffee which tastes awesome!! I love sitting around with everybody – a bit like The Waltons and I’m going to miss this immensely. I think I’m looking forward to going home – kind of! And seeing friends, family of course and the church family of St Columba’s is exciting. I just wish everyone could have come with us to see this place! It’s going to be hard to describe it all. I (Alan) have been writing these blog posts to keep people in Scotland updated and to reassure people that we are all well. Others have been keeping personal journals and taking photos. We will seek ways of sharing our experiences when we get more reliable internet access on our return. It was only when we shared at the end of the day today that I acknowledged some strong personal emotions. Although this is the start of a journey, for me it is also an end of a journey. This is possibly a bit self-indulgent, but it is maybe appropriate to tell a little of the story which started six years ago. The story which has led us here is really much more complicated and had many other threads, but this is part of my involvement in it. 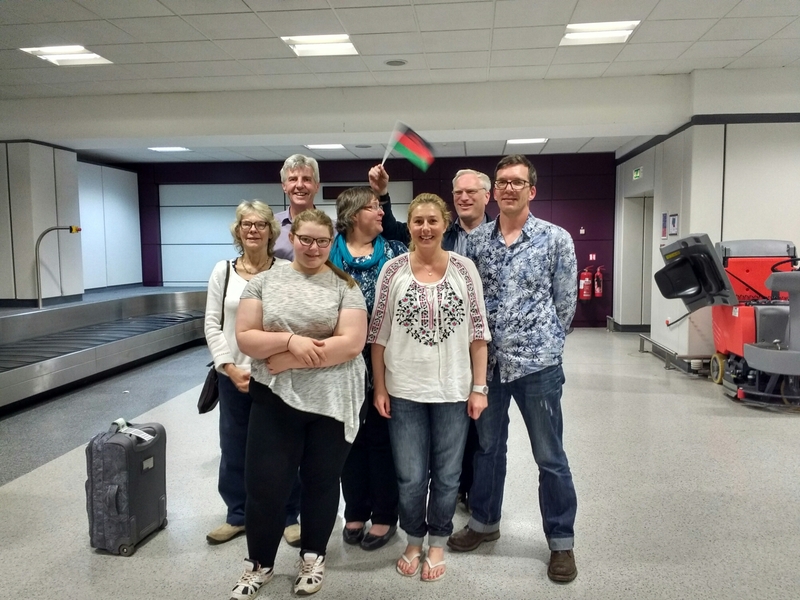 When I was training for ministry, I had the privilege of spending 10 weeks in Malawi working with several ministers and several village churches. As has happened to many people, Africa got under my skin in ways that I still don’t really understand. On my last day here, Joseph, then Session Clerk at Chuluchosema, asked if Chuluchosema could have a partnership with the church where I became the minister. I explained that that I could not promise anything, because any partnership would need to be right for the two congregations, not just for the ministers. After I was called to St Columba’s, I shared this story and we agreed to wait to see whether a partnership would be right. Last year, Margaret and I had the chance to return to Malawi and we visited Chuluchosema again. It was clear that a partnership would still be a possibility. 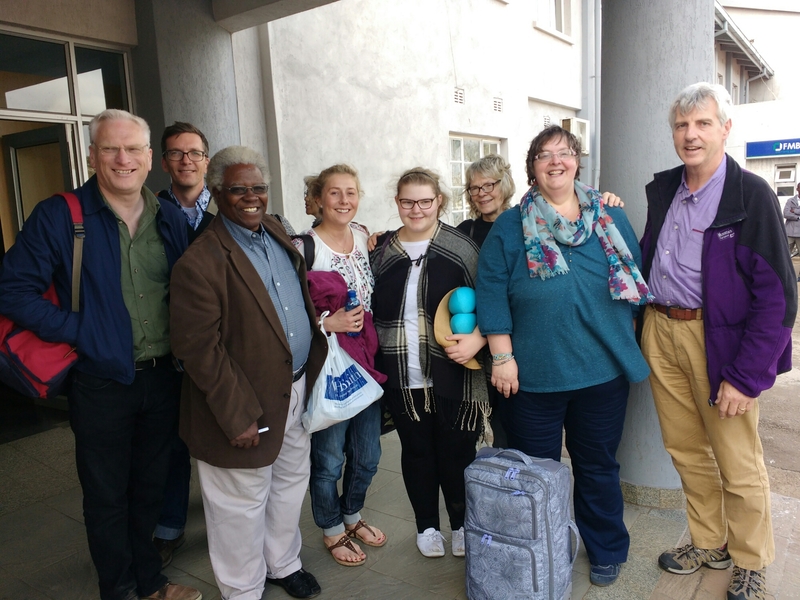 At that time, it also became clear to me that our ongoing relationship with our friends in Malawi was different from the possibility of a church partnership and was not dependent on a relationship between the churches. However, for reasons that I don’t fully understand I bought a Malawi wristband and I have been wearing it continuously since then. It has come to represent my prayer that the two churches would explore the possibility of partnership. Since then, both Kirk Sessions have agreed to explore a partnership, committees have been formed, many people have been involved in fundraising for travel and shared projects, we have drafted, redrafted and agreed a partnership agreement, both churches have agreed to form a partnership, seven of us have given time to this visit and many people have put a huge amount of effort into hosting us here in Malawi. Today we signed the partnership agreement and we have stepped out on a five year journey together (with options to renew). Since my prayer has been answered in ways that have been more special than I could imagine, I cut off my wristband today. I am not intending to cut off my involvement in the partnership and I look forward to the journey ahead. However, that action will be a reminder to me that it is not my journey. It is our journey. It has been a very special and somewhat emotional day. Self indulgence over! Today we joined in worship with the congregation at Chuluchosema. The idea of a church service which lasts nearly four hours seems almost unimaginable to most people in Scotland, but all of the group enjoyed the experience, especially the singing. Hopefully we will be able to load and edited recording onto the St Columba’s church web site when we get home. Gavin and John led the Children’s address, which was very well received, Nicola did one of the Bible readings, Alan preached. Silas and Alan shared the celebration of Holy Communion using the trays donated by Kinross Parish Church and St Columba’s, which we also used for communion in St Columba’s two weeks ago. Margaret, Sue, Lauren and John joined elders from Chuluchosema to serve communion. As part of the service, we signed the partnership agreement. We were united today as partner congregations in ways that we probably don’t fully understand and we are on a journey together. As Montford (the partnership chair) said, we don’t know where this journey will take us, but we travel together with God. We concluded the day with a wonderful meal at the Hotel Splendour, which opened recently in Zomba. As has happened most evenings, Silas invited to share our experiences and reflections on the day, which were all very positive. Saturday at Chuluchosema means the Saturday Feeding Programme (every week) and the Agogo Club (once a month). We were fortunately able to attend both yesterday. 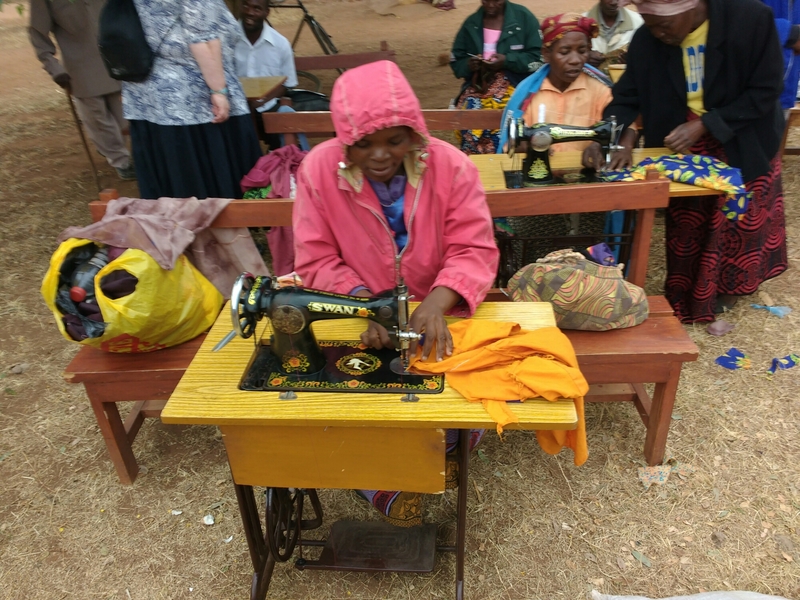 The Saturday Feeding Programme is for young people who learn useful skills like sewing and knitting and they are provided with a meal by the church. Since there is no electricity, they use Chinese versions of traditional Singer sewing machines. We were instituted as honorary members of the Agogo club. 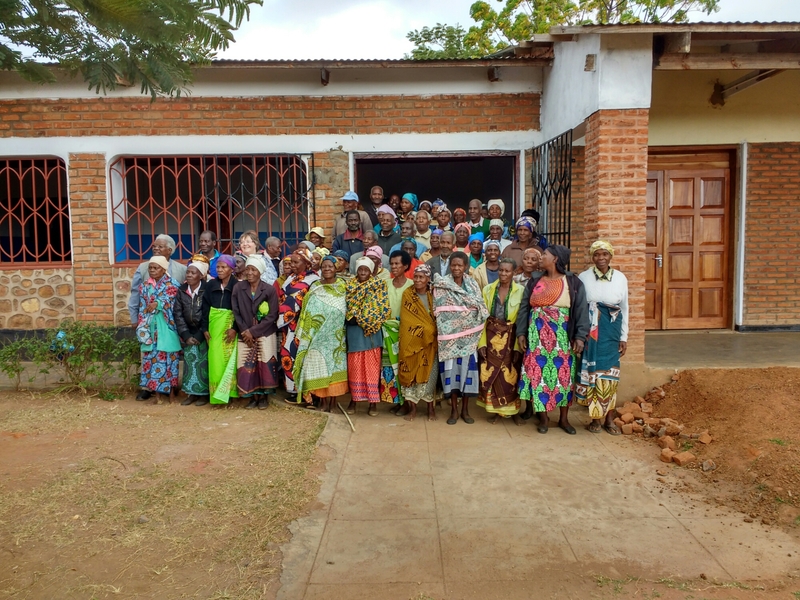 Agogo is the Chichewa word for grandparents, although the club is for anyone over 60. The oldest member is 96 and most of them are between 60 and 80. Previously, a lot of older people were isolated in the village with limited opportunities to meet up. The club starts with a brief time of shared worship, followed by announcements then shared stories. One of the group (an 86 year old retired teacher called Alan) is a herbalist and he showed the group some plants and spoke about their medicinal properties. After this we joined in the exercises. These started with stretching and movements and then we were put into pairs and took turns to pound each other on the back. We were asked to lead part of the exercise session and taught the Hokey Kokey to the group, much to their amusement. To finish there was a shared meal and the opportunity for the Agogo to visit the nurse in the clinic. This service is provided by Silas’ wife, Margaret, who was assisted by Nicola. A free afternoon allowed some of us to have a rest while others had a not totally successful attempt to walk into town. Although they didn’t find the market, they did find their way back to the hotel. The surreal experience for the evening was preparing for tomorrow by all (or at least all who were not giggling too much) singing “Spirit of God, unseen as the wind” and “Our God is a great big God” in the hotel restaurant. Today we will join in the Sunday service and sign the partnership agreement. Yesterday we had a very special day as we split up into ones and twos and spent the day with different families in the village. This was a very different experience from going around as a group. We were able to see what everyday life is like for people in Chuluchosema. We were invited into houses, ate together and some of us got the chance to join in the food preparation and other activities. The hospitality from our host families was wonderful. We now each have new friends. The day also gave us a lot to reflect on. We shared or experiences and talked about our feelings in the evening, but we will each be continuing to process our experiences for a while. We are all still well and there have been no mishaps. There were one or two interesting situations like when Lauren and Nicola blew up one of the balloons they had brought for the children. However, all the children were outside at the time so four adults ended up patting the balloon to reach other around the room for several minutes, “because none of us knew how to stop”. Today we will join in the Agogo (Grandparents) Club and see the Saturday feeding and craft project. The weather remains overcast and cool, but apparently a lot drier than Glenrothes. Now that the Independence Day is over, we will be going back to Chuluchosema today to spend time with families in the village. It should be an interesting day and a chance to build relationships. We are now settled into Annie’s Lodge in Zomba until our final night in Blantyre. We have pretty good internet here in the mornings and evenings. If anyone needs to contact us then text messages to Alan’s phone are working fairly reliably. Phone calls are moderately reliable. However, for some reason we haven’t yet worked out, he can only send messages in reply and not phone calls. Everyone in the group is still doing well. The food is good and we have comfortable accommodation. The closest we came to a mishap yesterday was when Lauren was apparently overcome with laughter at Sue’s experience of a cold shower. Zomba market was an interesting experience for those of us who had not been to an African market before, but we all returned in one piece, even though we came back with slightly more passion fruits than planned! We will have space in our luggage on the way home, so if anyone has any requests for African paintings, wood products, cloth etc. then send a message to one of us and we will see what we can do. 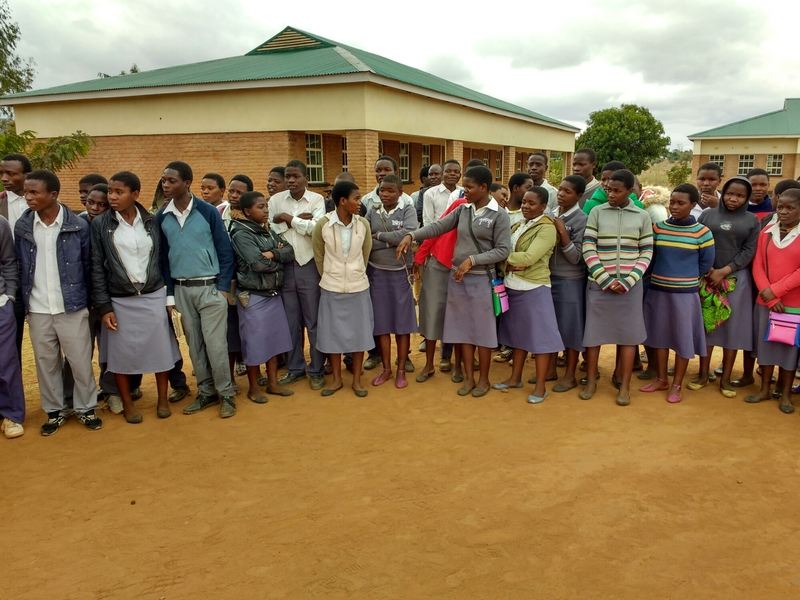 At the end of next week, Draper Secondary School in Chuluchosema finishes their first Session. There are still many plans for further development, but it’s looking great. We enjoyed a visit on Tuesday and we will be going back today. Sorry for the break in updates. Yesterday was a national holiday, so not a good day to be in the village. Instead we went to Kutchire Lodge near Liwonde Wildlife Reserve. No internet! While we were there, our bags arrived! That meant a combination of relief at being reunited with everything and a sense that we had coped very well on our hand baggage and a small top up from the shops. Everyone is well and is having a great time. This was enhanced by 24 hours as tourists rather than church partners. We have seen elephants, crocodiles, hippos and much more. Now we are back in Zomba and tomorrow we go back to Chuluchosema. We had our first visit to Chuluchosema as a group today. It was wonderful for Margaret and Alan to see friends again and to see the changes since our last visit. For the rest of the group it was variously mind blowing, very interesting, great, incredible, informative and overwhelming. There was a lot to take it as we visited the kindergarten (including their morning porridge enriched with vitamins), primary school, sewing project, church, water project, teachers houses and clinic. We also met members of the partnership committee, teachers, elders, cooks and many others. 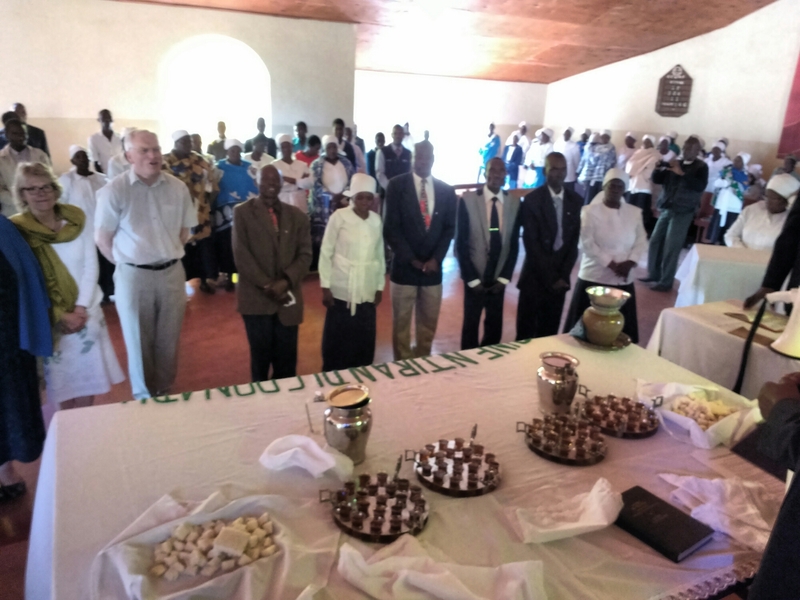 In addition to Chuluchosema, we saw the Mary’s Meals project in Zomba, filter by the street children project and had a quick visit to Zomba Theological College. The challenge of the day came when an ATM greeted Alan with a Windows error message and reboot screen instead of returning his bank card – after closing time on the day before a bank holiday. But this is Malawi, so the friendly security guard phoned the manager, who had not yet gone home. He came and unlocked the front door, listened to the story and returned two minutes later with the card. Sorted! Tomorrow is the day when Malawi celebrates independence from Britain, so we will not visit Chuluchosema. Instead, we get a night near Liwonde Wildlife Reserve, while Gavin and Silas attempt to recover our bags which are due to arrive at the airport. Then they will join us. We are in Malawi. We are all well. We have slept well in comfortable beds. We have showered and breakfasted and….. We have had some adventures! Flight delays meant that we had to run through Heathrow and Johannesburg airports. Our bags were less good at running than us, so they stayed in South Africa. However, they should arrive on Wednesday and the airline have promised to pay for some clothing and toiletries to keep us going. We also each brought some spare clothes. Apart from crosswinds causing our first landing at Blantyre to be aborted, finding that we are in a different hotel than expected (we are now in Annie’s Lodge in Zomba) and some enthusiastic driving, everything has been going much as expected. 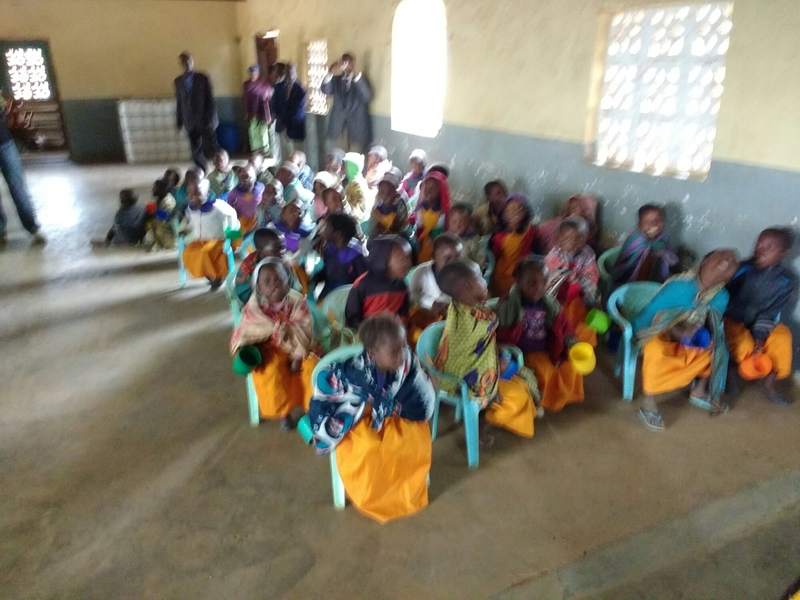 Technology and internet access permitting, we will be recording some aspects of the first formal partnership trip from St Columba’s to Chuluchosema CCAP, which starts on July 3rd.